Why do I take pictures of such things? No wonder I find laundry to be such an overwhelming task. Yes, I know there are solutions to my problem. I know that I really just need to take the whole thing bit-by-bit. 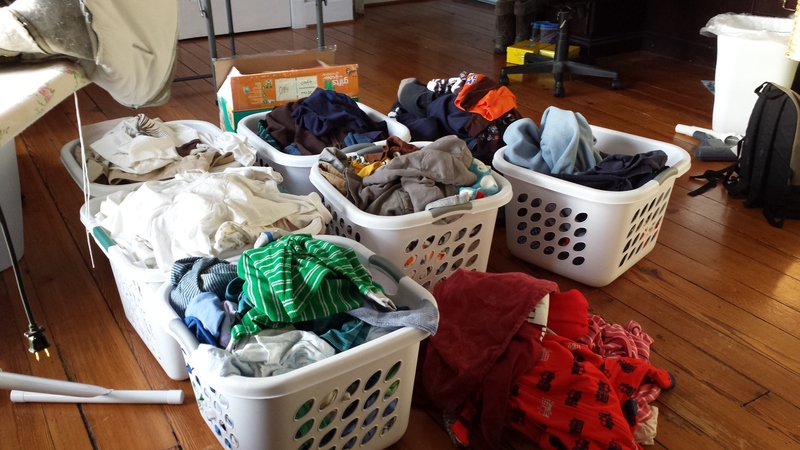 But I seem to be stuck in that all-or-nothing cycle: waiting until the laundry piles up, finally tackling the whole mountain at once, and then running away from the task. Rather than taking the initiative to make life easier on myself, too often I just sigh and groan and berate myself for landing knee-deep in stained shirts and soiled sheets. Again. 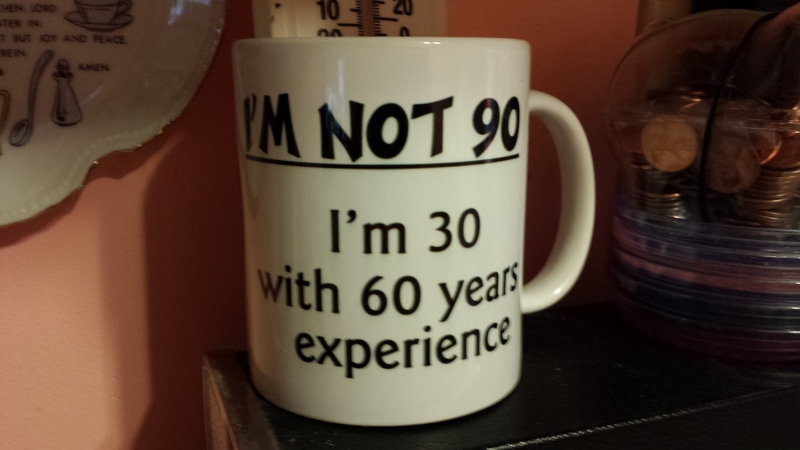 My Mom-mom had a little gift for me. “See this?” she said. “This is what I used to wash Sue’s laundry when we were living over the funeral parlor. I’d wash her things with it every day.” (Sue is my father’s older sister, who was just a baby when my grandparents lived in a small apartment over their little town’s funeral parlor.) Mom-mom was smiling. “You can even have the dirt!” she laughed. The simple device hit me like a ton of bricks. At home, I had the following waiting for me: three baskets of unfolded clean laundry, at least four more baskets of dirty laundry, and a newish, 2nd-floor washer and dryer. Oh, and boxes of disposable diapers. Because I know myself well enough to realize that cloth diapering might just push me over the edge. And that’s just the laundry. I have a dishwasher and a microwave and children’s television programs to occupy my boys when I need a break. I have plenty of space. I have the means to purchase as much good food as my family can eat. I have adequate heating and cooling, plumbing and electricity. I have a husband who changes diapers and cleans bathrooms. My grandmother’s father abandoned her family when she was a toddler. Her mother was left to return to her parents’ home with their three small girls. They lived in the attic, where there was no heat in the winter and far too much of it in the summer. They shared the rest of the house – and its one bathroom – with Mom-mom’s grandparents, aunts, uncles, and the many railroad workers my great-grandmother fed on a daily basis. Mom-mom’s role in the family business was to stand on an overturned bucket at the sink and wash the workers’ dirty dishes. Later, my grandmother would raise six children in another one-bathroom house: this one the size of two of my fourteen rooms, combined. So, do I feel like an ungrateful wretch, or what? Kind of. 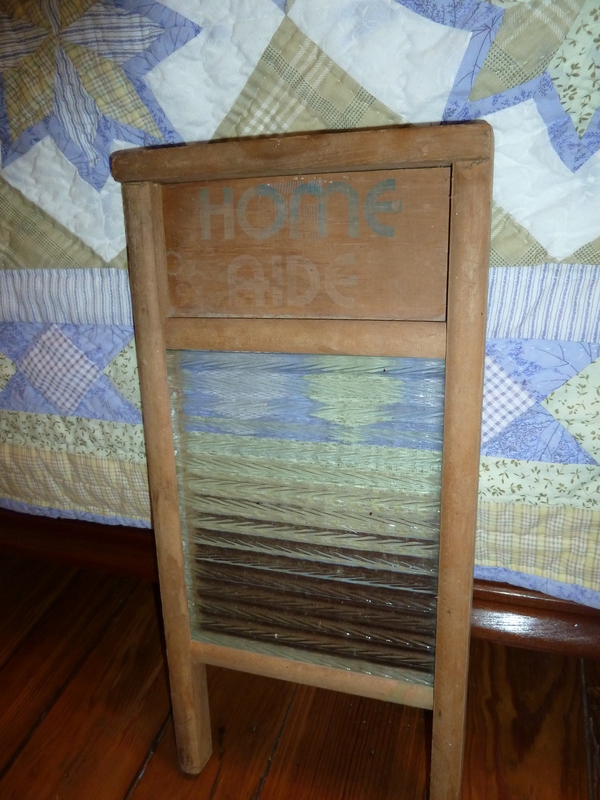 Certainly that simple washboard – and my grandmother’s amused, happy face when she gave it to me – put me in my place a little. It reminded me of how fortunate I am. It made me view my household tasks differently. It made me think that I should approach my responsibilities with a little more perspective. Now, I’m not big into unnecessary guilt trips. I’m not one to think that everything that is wrong is happening right now, right here: a symptom of excess in my own age and society. No culture has ever been without its struggles and sins. And just because I don’t share the particular stresses my grandmother experienced, it doesn’t mean I don’t have any. It’s so easy to become overwhelmed with the daily tasks involved in caring for children and keeping a home. 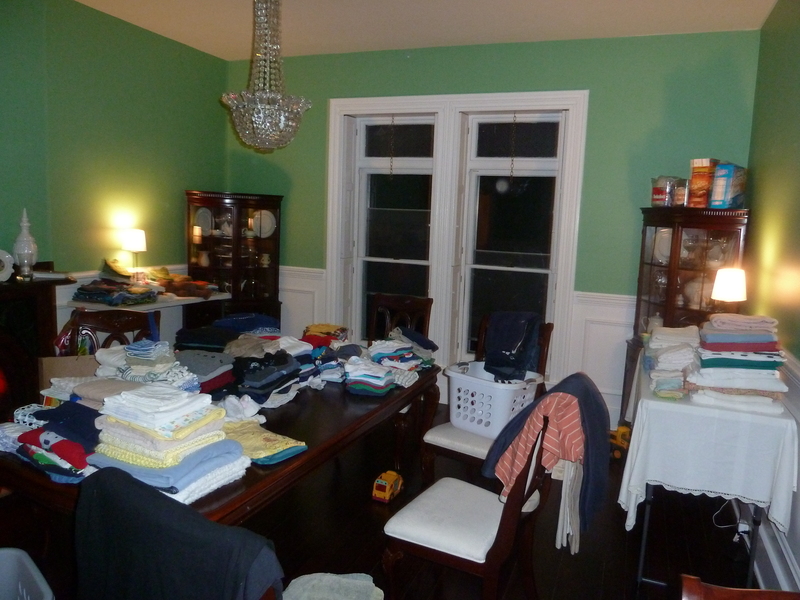 Undertaken individually, of course, the tasks aren’t particularly difficult: making a meal, changing a diaper, doing the dishes or the laundry – all simple things. But in real life they rarely are undertaken individually. Children sit on your feet and crawl between your legs while you cook dinner; they buck and kick and twist while you change their diapers; they whine and brawl while you work to ensure they have clean dishes and clothes. With good cause, we parents feel like we’re pulled in a hundred different directions. It’s understandable that we become overwhelmed. But we still have a choice. We can choose to sulk and angst and convince ourselves that we just can’t win. Or we can choose to let all that frustration roll off our backs. Far too often, I do the former. Some people seem to be able to survey the mess in their homes, their uncooked meals, and their disheveled children and let out a good, hearty laugh. God bless those people. I am not one of them. I’m the perfectionist, OCD type who sees flashing neon signs over every toy lying on the floor, every sink of dirty dishes, every scrap of dirty clothing: “WORK, WORK, WORK,” the signs say. I am easily overwhelmed, and I find all those signs, along with the chorus of calls and screams and roars from my boys, overwhelming. So I either attack all that work with abandon, or I shove it to the side and pretend it doesn’t exist (all the while feeling guilty). The former is not sustainable, the latter is not healthy. But Mom-mom’s washboard gave me an idea. Regardless of whether I’m doing one load of laundry or twelve, I should be more at peace while I’m doing it. I should be grateful. I should remember the alternative: not just of a sentimental-looking washboard, but of generations of women who did (and still do) their washing in buckets and basins and rivers. I should sort and transfer and fold our clothes with care. I should use those moments to remember, to ponder, to imagine – not to berate myself. I should feel honored to have a small measure of labor that echoes those who came before me. A little over three years into my role as mother and homemaker, I’m continuing to learn more about myself every day. I’m a better mother – a better, happier person, I think – than I was when I began this important work. I still frustrate and disappoint myself on a daily basis, but I’m improving. Slowly (slowly) but surely. 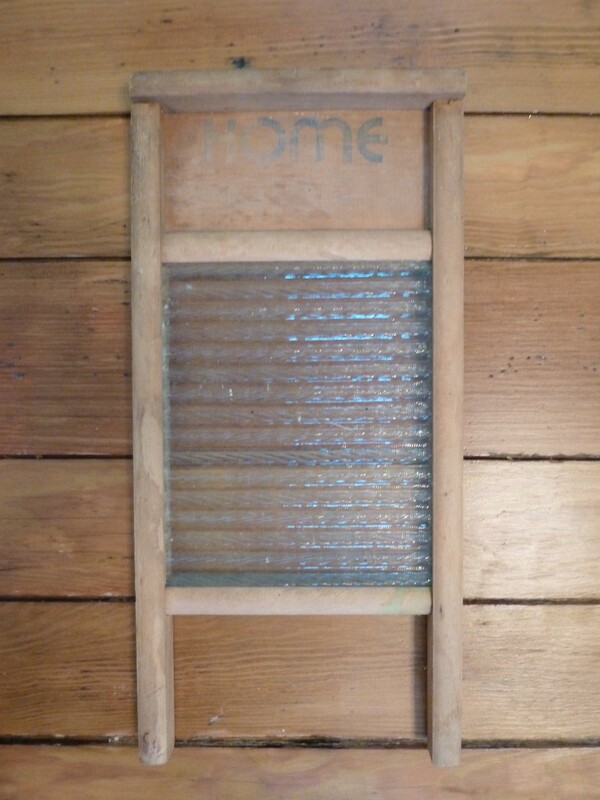 Thank you, Mom-mom, for that lovely washboard, and for all it represents. What a good reminder. Thank you, Jenny! I have the same approach to laundry. And I get overwhelmed. And I cry. And then just as a heave a sigh of relief at completion, I look in the hamper to find…more dirty clothes. I know it’s never-ending…but…sheesh!